Stay on time with eWatches, online at eWatches.com. For over 10 years, eWatches has been offering a huge selections watches for both men and women. With top brands including Gucci, Christian Bernard, Guess, Movado, Seiko, Invicta, Bulova, Citizen, and Swiss Legend, you're sure to find a style you'll love. All products on eWatches are new and 100% authentic. No matter what the occassion, eWatches.com will have that special men's or women's watch to fit your budget. Save on your next timepiece purchase with top eWatches coupon codes, eWatches discounts, and eWatches promotions from RetailSteal.com. eWatches.com is now offering free shipping on all orders shipping to the 50 United States, Puerto Rico, and APO/FPO addresses. See site for full refund and return policy. Shop at eWatches and enjoy $30 savings on orders $265+ with code. Shop at eWatches and enjoy $50 savings on orders of $50 or more with this code. Shop at eWatches and enjoy $15 savings on orders $75+. Click here for code. Shop at eWatches and enjoy $10 savings on orders $90+. Click here for code. Save up to 91% on clearance deals at eWatches plus get free shipping. Click link to shop now. Shop at eWatches and enjoy 90% savings on Back to School Sale items. Click here to shop. Head over to eWatches and save up to 89% on watches. Shop at eWatches and save up to 80% on the Seiko Men's watches. Click link now. 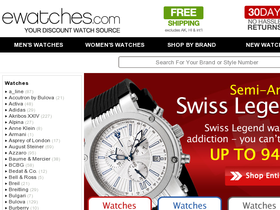 Shop online at eWatches.com and save up to 60% off top watch brands like Invicta, Citizen, Bulova, Movado, and more. Shop at eWatches and enjoy 50% savings on Kenneth Cole and Skagen. Click here to shop. Shop at eWatches and enjoy 30% savings on White Designer Watches. Click here to shop. Shop at eWatches and enjoy 30% savings on Michael Kors. Click here to shop. Enjoy free shipping on every order from eWatches. No minimum purchase required. Go to eWatches.com for watches starting under $30. Shop and save big on brands like Seiko, Lucien Piccard, Puma, and more. Click link to shop.